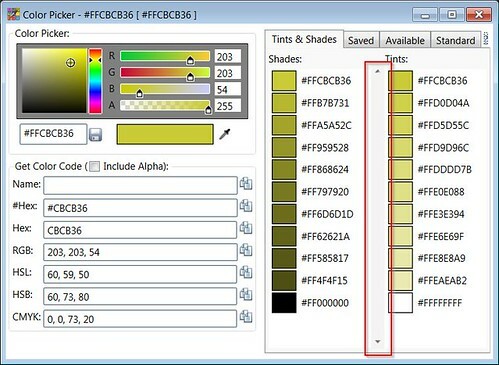 Click here to download Color Picker extension for Visual Studio from Visual Studio Gallery. Note: please show your support by giving a quick review in vsgallery . It only takes a few seconds. Highlight colors in Visual Studio Document Editor (.css”, “.scss”, “.less”, “.asp”, “.aspx”, “.htm”, “.html”, “.cshtml”, “.vbhtml”, “.xaml” are enabled by default), Additional Parsing, Customize using Tools-Options-ColorPicker. Edit color using double click from any enabled file (editor). Copy\Paste Color codes (Name, #HEX, rgb, rgba, hsl, hsla, hsb\hsv, cmyk). rgb and rgba are offered in different formats. Selected color’s Tints & Shades. Color code comparison of Orginal and New. Color Picker can be accessed via Tools->Color Picker (will open a Dockable Window). I have uploaded the initial source code in CodeProject. Please share your suggestions and feedback. 1. I miss – since I used this in the past a lot of more often – a switch to use a HSL color specification. 2. The RGB spinboxes vary in the width depending on the count of digits to be displayed! But this non-fixed width of the spinboxes changes the total width “Color Canvas” UI element dynamically. 3. In C++ I often have to use the RGB macro, but placing the cursor inside this macro, selecting the macro, or selecting the 3 integer values does not pre-fill the color picker while opening it. I can’t even paste the values into an edit field to let the color picker switch to this RGB color values. 4. I only can copy a HTML/CSS related hexadecimal formatted number as string, but I cannot copy a list of three integer values, separated by commas, a preprocessed template like “RGB(%r, %g, %b)”, or the result of an RGB macro evaluation, the DWORD value containing the RGB+Alpha value. Any chance to get not only cosmetical, but functional updates integrating the color picker better in the editor? Thanks Martin for the feedback, All suggestions sounds good to me. I can update this tool with your suggestions except editor support. Will reply here soon. Hello Martin, I just released version 1.1 with some changes. Please try updating. Excellent, Would it be possible to add a combo with the known named colors? Available Colors and Standard Colors are there in the color picker combo box. I will be changing it to a list box (in next version). Please rate this in visual studio gallery. Thank you. I see now but you have to hover it to see the name! Even I wanted to see the name. :). I will be uploading another version soon with the changes. Thanks Eric for the suggestion, I have made your suggestions available in v1.1, please try updating. Thanks for the upgrade. I love it. The only/last thing I would like now is the possibility to enlarge the form if you ever do another version of the tool. Currently, it seems that it is limited to the height of the controls on the left. Thanks for all the changes! If I want to insert a COLOREF or want to change a COLOREF, I’d really like to use your color picker from the source code editor to get the new or change COLOREF as easy as possible back! So – what’s about a next enhancement? A color wheel with strategies to find matching colors, to fill color palettes … eventually with automatic C++ Win32 source code generation? Your color picker is wonderful! also please do a quick review in vsgallery. Hello sheemer, first of all thank you for a nice plugin, unfortunately I can’t be install it for VS Express 2013 for Desktop, does your installer support Express versions of VS? How can i make it work with the express version? I would be glad if you help, thanks in advance. Please could you let me know how I can uninstall this? Since installing my visual studio takes 10 mins to open and cannot be accessed when alt-tabbing between apps. I’m prob just unlucky with this but would prefer to just remove. Are you still facing issues with version 2.0? Just wanted to check the mentioned issue is till there or not, Thank you. Amazing utility, you are the best!!! Extremely useful for lightening / darkening an existing colors, so the existing color palette can be maintained, but items can be emphasized or not on the screen. I have a color and I want to know if there is a name for this color. And if there is no named color for the given RGB values, I wanted to know, which colors are near to it. Or otherwise I wanted to filter all color names using a name fragment to look for a good matching color. But nothing of these use cases are currently supported? Any chance for enhancments like this? PS: And … still often wishing to find in your color picker … the HSV or HSL values! Thanks for the test version and it looks quiet good! Thanks for picking up some of my suggestions! Just one question, why there is a scrollbar between “Shades” and “Tints”? Forgot the screenshot showing the scrollbar https://farm9.staticflickr.com/8873/17970359258_c651d23bd7.jpg and to mention … I use 125% scaling! Glad to hear your comments. I will be uploading this to vsgallery today. Scrollbar was given to scroll tints and shades together, probably will be doing a cosmetic change on that. Hello Martin, Have released 1.2 version to the visual studio gallery, Thanks for sharing your comments and Please drop a feedback there in gallery. Some the group labels are or checkbox label is missing and the window background does not use the high-contrast-theme window background color (GetSysColor(COLOR_WINDOW)). I think, that changing the window background color will make the group labels/checkbox label reappear! Another thing I realized … the state of the checkbox to include or not to include the alpha value is not persistent, is it? Could you plese take a look at the color picker or at your applications/extensions taking care for accessiblity/barrier free usage? Hello Martin, Please share the exact steps to replicate these points. Thank you. Sorry, for this really late, late reply! How to reproduce the problems I realized? my only complaint is that the dialog box is shown modally so I cant have the dialog up while coding in the IDE. its a nice utility but it would be nice to be able to have it available as a non modal dialog that way I can use it as a reference when coding. 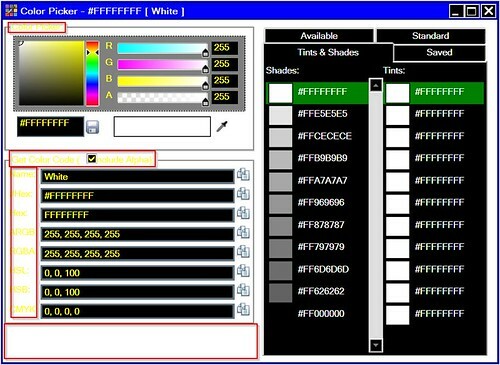 Hi Kevin, I have made some changes to the color picker, please let me know your feedback after updating to latest version. Please consider making the dialog non-modal with option to keep on top – thanks! I found the standalone version thanks. Could you update it to include the extra color code conversions and the Tints & Shades tab as per the VS version? Thanks! Sure, Will take some time. Any chance that the next version will support normalized color values? I.e. instead of from 0 to 255, it will have an option to have from 0f to 1f? Normalised it would be: 0.88, 0.75, 0.64, 0.36, basically every number divided by 255. Hi, the color-picker plugin is relay good and helpful. Great work! It would be great, if your Plugin can also support the Visual Studio 2013 Dark Theme. (You can change the theme in the settings) There are some compatibly problems. I recently tried to use the color picker as tool window, but … since I’m using desktop zoom and was in a debug session with docked windows like callstack, watch, etc. the content of the color picker tool window was not completely accessible and partly out of sight. Could you please add scrollbars for the case, the window size is insufficient to display the complete color picker window content? BTW wouldn’t be nice to have the nearest (to the current color) available/standard color in view/highlighted if switching to the related tab? And … the W3C specifies guidelines for colors to be used, e.g. formulas to calculate the hue and brightness distances. For UI design it might be very helpful to have the ability to compare two colors to get informan about the “difference” between those two colors and if they are usable within the W3C defined range. So it would be nice to be able to compare the current color with a color chosen in a tab. Or nice would be a function that calculates the color just fulfilling the rules of the W3C changing the hue and the brightness. As usual thanks for the great points, will be checking these points in coming version. Could you you please share the scrollbar requirement case with steps to replicate the same. I use 1920×1280 display resolution and 150% display zoom. I have docked windows in VS2015 at the bottom of the main window. Now open the color picker and drag it to the center of the client area to make it a “document” window with a tab in the row of document tabs. Now resize the bottom docked windows (callstack, watch, auto, local, etc.) dragging the splitter to the top, so that there is not enough available height anymore to show the complete color picker contents. Thanks for the suggestion, next version should have this functionality. How can I change the background color of the Color Picker dialog? Blackish text and background make the labels impossible to read. Also, is there a way to clear “saved” colors”? Finally, an enhancement, how about an “eye dropper” tool to pick a color from anywhere on the screen? How can I replicate the background color issue? You can use the del (delete) key to delete a saved color. Are you not able to use the ‘eye dropper’ any where in the screen? This should be good in version 2, Please let me know your feedback. Thanks for the comment, added color names 🙂 in latest version. Oh also, it would be useful to edit the extensions which are analyzed for color codes. If that’s too much, adding .cs files would be helpful as I have some theme palettes defined in C# code. Please update to latest version and add the required file extension using Tools-Options-Color Picker, Let me know your feedback. #1 Pasting a full color code with mouse Right-Click doesnt seem to work properly. The color doesnt change. #2 Pasting a color code without the hash part using the keyboard CTRL+V results in an error message. Keep in mind the right part of the code was correctly selected before pasting, but it still failed. Thanks for reporting this, please update to latest version and let me know the feedback. I like that it underlines all the css colors in the appropriate color. The only problem that I have with it is that it also highlights JQuery IDs with colors as well. For example, if I type $(‘#ddBasicSearch’), it underlines the #ddBa part in a tan color. I cannot find a way to change the default behavior of this or find a way to prevent code underlining. Either one would solve my problem. Thanks for the comment, you can disable the color highlighting option from Tools-Options-Color Picker in latest version. Thanks. That is exactly what I needed. Awesome tool. Hey, when I go to install the color picker, it does not allow me to install to VS2017. Any Idea? Hello, Is it throwing any exception, which version of vs 2017, what is the OS? Hello since I updated my Visual Studio to 2017 two things happened. First double click on any color opens the Color Picker which is very frustrating. Second There seems to no options on Tools -> Options anymore. How can I disable double click Color Picker opening? Are you using version 2.3? Latest version got an option to enable/disable color highlighting. I don’t want to disable color highlighting. I want to prevent Color Picker from showing when I double click on a color. I mean if I have color=”orange” and i double click orange, Color Picker shows up, which is kind of annoying if you just want to copy the color. About the version, you were right. I didn’t use the latest version. Now I have options but there is not an option to disable this behavior. Will add another option in next version, thanks for your reply. Thank you sir. Best regards. Hello, Please update to version 2.4 to get this feature, Please have your rating posted in visual studio marketplace. Fantastic tool! Many thanks for making this available. The only suggestion I have is that since I often work with colors in VS source or in XML files where the color is represented simply as a set of 3 0-255 values, would it be possible to add one more “recognizer” to your color recognizer algo that can see those values as colors? But, it can’t see the color if it’s just the bare three numbers. In any case, fantastic work again! Thanks Darin for the good words, let me check the possibility in version. Thanks for the reply. If there’s any way I can help, let me know. I saw the source of the older version but didn’t see any updated links out there. I would also be happy to help. Do you have a public repository for this extension? Hello, this is handled in version2.5, enable additional parsing option using tools-option-colorpicker. Please rate this plugin in Marketplace, thank you. Fantastic plugin, what a lifesaver!! I ran into a bug, go to http://color.adobe.com, copy the hex code below any color, go to the plugin, and pasting that text from the clipboard crashes the plugin. I have to quit VS. It doesn’t matter if I manually type in a ‘#’ character first or not. It seems like it can’t handle the non-plain text clipboard format, I presume? If the clipboard is plain text, pasting works fine. Great work though, I’m loving it!! Hello, Is this correctly working in other version? Unfortunately, I could’nt try it on another version of Visual Studio. Just VS 2017 Ent. Hello, How do I replicate this in VS 2017? Actually, I don’t know. I looked at your project’s codes on CodeProject but almost nothing there. Besides, that version on CodeProject was older. I tried look your code over JustDecompile but couldn’t found the code what I looking for. Maybe, this bug occurs because of Microsoft.VisualStudio.Text.Logic version. I’m not sure. In this library, Utilities.GetColorFromString method made me think but I couldn’t sure. Hello, Are you still seeing this issue? Hi again. Unfortunately, I can’t look at it for a while. When I am able to look again, if I see an error, I will write here about it again. I find the underline highlighting to be very distracting, due to the variable length and being excessively long at times. I’d much prefer an alternative display option that simply inserts a clickable color square to prefix the associated color-code – consistent, functional and not distracting to the code. I really like using Color Picker in VS 2017 Enterprise. I must have missed a setting somewhere, but is it possible to open the color editor by right-clicking (or some other way) instead of when I double-click on a color in my code? When I double-click color text, I am selecting it to change it and I have to close the editor every time. I usually know what I want to type, but would need the editor on occasion for a color pick so opening it by right click or some other way would be much more usable. Is there any chance this project will be updated for VS 2019? Right now it will not install.